Babies and young children have an intense need for the physical presence of a consistent, loving, responsive caregiver. NHCS is blessed with an astonishing staff retention record and our infant teachers have been with us for many years providing specialized infant and toddler care in our nursery. Our teaching staff strives daily to provide quality care and playful, loving interactions with the babies in their care, in hopes of building strong bonds and healthy attachments. For babies, playing stimulates their senses, and helps them learn and develop. 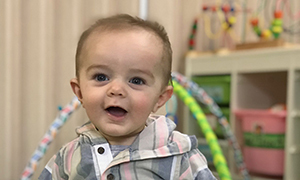 The cognitive, emotional and physical stimulation that infants receive from our knowledgeable staff helps improve their curiosity, attention span, memory, and nervous system development. Scientific research indicates that babies in a stimulative rich environment reach developmental milestones faster, have better muscle coordination, and a more secure self-image. Language development really takes off during the toddler years as children make major strides in understanding language and figuring out how to communicate. Because toddlers are better able to comprehend what is said to them and express what they want through words and gestures it is important to have a loving caregiver that is skilled in understanding and facilitating language development. Physical coordination is another area of major development for the toddler. Our teachers work very diligently to provide toddlers with activities that will strengthen their hand-eye coordination and manual dexterity. Through these carefully selected activities, toddlers gain better control over fingers and hands and develop a sense of curiosity to move on to more challenging tasks. All of our infant and toddler teachers have a Child Development Associate and are specifically trained in infant and toddler development.